Need some nice spring weather? 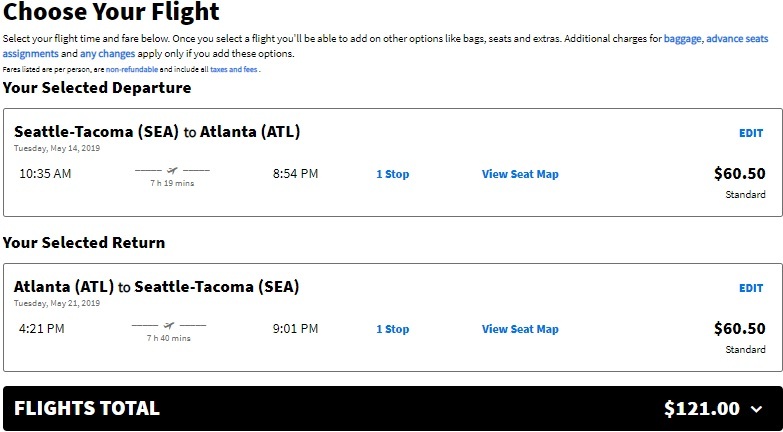 How about a last minute sale from Seattle to Atlanta, Georgia! This low fare is during the month of is on Spirit but has an easy one stop layover and a great price! Remember, Spirit’s ala-carte business model. Only a small piece of hand luggage is included and must fit under the seat in front of you. A checked bag will set you back $31 each way and $36 for a normal sized carry-on. Even including luggage, under $200 for this route is a steal. Use the May dates on the calendar below and book direct through Spirit.com for the frugal fare!